Asturias is the autonomous region on the north coast of Spain, bordered by Galicia to the west and Cantabria to the east. Its coastline is on the Bay of Biscay and its southern boundary is part of the mountain chain often referred to as the ‘Cordillera Cantábrica’, the Cantabrian Mountains. Its geography can be summarized by the rugged cliffs and clean, sandy beaches of the coast and the mountainous interior, culminating in the Picos de Europa. The coastline is extensive – some 190 miles of it – offering over 100 different beaches and protected harbours, many of them bordered by imposing cliffs. The predominantly limestone Picos de Europa, rising to 2648m at Torrecerredo, is an area of spectacular mountain scenery with deep ravines and beautiful river valleys. Asturias Airport lies near the town of Avilés some 47km from Oviedo. It deals with plenty domestic traffic including regular connections with Madrid and Barcelona but only easyJet offer an international service from the UK via London Stansted. An alternative for UK visitors is to take Brittany Ferries to Santander or Bilbao from Portsmouth or Plymouth and then drive along the north coast to the region. Alternatively you can take a ferry across the Channel to the lovely town of Saint-Nazaire in Brittany then catch a ferry with LD Lines to the Asturian port of Gijón. If you’re relying on public transport once you arrive then have no fear as the RENFE rail network links both Oviedo and Gijón with the rest of Spain whilst the ALSA bus company provides thorough coverage of the whole region and links Asturias with other parts of Spain. 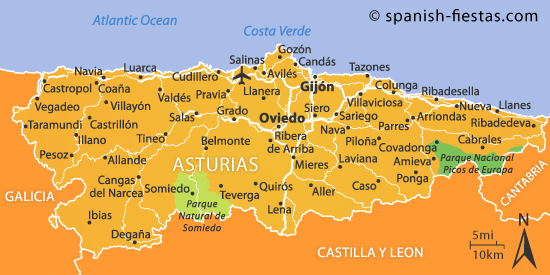 The two main cities of the region are Oviedo, the capital, and Gijón, the largest city. Oviedo is a clean and attractive city with some fine pre-Roman architecture and a fascinating old quarter. Gijón, altogether bigger and livelier, has a lovely area, Cimadevilla, near the port but it can get very crowded when there’s a cruise ship in town. The Asturian coast has an abundance of unspoilt, picturesque fishing towns and hidden beaches. Places like Cudillero, Luarca and the Senda Costa (the coastal way between Llanes and Pendueles) are a revelation to first time visitors whose perception of Spain is based on the typical package holiday ‘costas’. A personal favourite is Ribadesella which is surrounded by amazing scenery. It has some great little bars and restaurants and is a great base from which to discover the region provided you have your own transport. Visitors to Asturias, however, tend not to come for the beaches – wonderful though many of them might be. The Picos de Europa National Park offers some of the very best walking and climbing country in the whole of Spain. Try to get a glimpse of Picu Urriellu at sunset – and then you’ll appreciate why it’s locally known as ‘El Naranjo de Bulnes’ as it glows orange in the evening sky. There’s also the idyllic area around the little town of Covadonga, right in the heart of the mountains and site of King Pelayo’s Virgin Mary inspired victory over the Moors that sparked the whole Reconquest. The lakes above the town, often cycled around during the Vuelta a España, are very popular walking areas. Other attractive mountain towns or villages include Soto de Sajambre, Lebeña, Arenas de Cabrales and Arriondas but, as you drive along the spectacular mountain passes or walk along the many trails, you will discover many delightful gems of your own. Rest assured that by visiting Asturias you’re going to see some stunning scenery but bear in mind that this is one of the wettest regions in Spain with some parts having as much as 2000mm annually. Summer in Asturias is generally warm and sunny although not without rain. The winter weather varies significantly between the coast and the interior mountains. Along the coastal strip the winters are generally mild and wet but in the mountain areas they can be very cold and snow is likely between November and May. The biggest annual festival of the Asturian calendar is the International Descent of the River Sella (‘Fiesta de las Piraguas’) which takes place on the first Saturday in August. This is an exciting canoe and kayak race that goes from Arriondas to Ribasdella attracting competitors from all over the world. Another good time to be in the region is on the 2nd weekend of July when the village of Nava celebrates its annual cider festival. Obviously walking is extremely popular in this part of Spain which offers a first class mix of forest, mountain and valley trails. Included amongst these is the French route of the Camino de Santiago, which passes through the length of Asturias on its way to Galicia. There are many trails of differing degrees of difficulty. During the winter there are two areas which can provide excellent conditions in which to ski: Valgrande near Pajares, and Asturleonés in Aller. Both areas are well resourced with ski lodges and other facilities. With its rugged and varied terrain Asturias has developed a reputation as a centre for adventure sport enthusiasts which attracts mountain climbers, mountain bikers, snowboarders, hang gliders and pothlers to the challenging slopes of the Picos de Europa mountains. And whilst the Rio Sella has developed an international reputation amongst canoeists it also offers something a little less dangerous in the form of excellent salmon fishing. In an area with so many fishing harbours, fish is a large part of the diet but probably the most renown Asturian dish is the enormously tasty ‘Fabada Asturiana‘ which is a wholesome mountain stew made with several varieties of beans, chorizo, pork and anything else the cook decides to use up. Also popular is ‘Carne Gobernada’, a dish of beef and onions often cooked in white wine and served with fried potatoes. Asturian cheese is famous throughout Spain because of its quality and diversity. The climate of Asturias is better suited for the production of apples rather than grapes and consequently cider is considered as the region’s ‘wine’. Don’t try and pour it out like a local waiter, though; they hold the bottle well above head height and pour the drink into a glass held near ground level. This is not just for show but because the cider is produced without gas and this puts some ‘fizz’ into it. Have You Been to Asturias? If you’ve been to Asturias and have any useful recommendation for our readers we’d love to hear from you. Great little hotels? Any nice places for lunch? Just add your tips in the comments box at the bottom of the page. Last Spring we took our camper van through France to Northern Spain. We have lovely memories of the wonderful scenery of Asturias and the friendliness of the people there. We camped at Candas and Cudillero and were luckily blessed with good weather. It was very uncrowded at that time of year except perhaps at weekends. We enjoyed seeing all the pilgrims on their way to Santiago, some even walking on the side of the main roads. Scary! We did find it hard to find a supermarket at times so shopped till we dropped when we found an accessible one. We got to Santiago and saw the beautiful city and the happy pilgrims in the pouring rain and then headed East across the country to the Mediterranean. A great trip. That sounds like a brilliant trip Annette. I’d have to agree with your reference to the friendliness of the people in this part of the country. They really are so open and welcoming. Once again you have given ideas to those who like to get around and we have seen the start of some of the scenery on our way to Bilbao, breathtaking. I’ve selected Asturias for this particular article but in actual fact the whole coast from the French border across the Basque Country, Cantabria, Asturias and Galicia is fabulous. Thank you for the article, it is a region in which I have had an interest but not the knowledge. Your article has certainly confirmed my desire to visit there as soon as I possibly can. Thanks Sonia … you won’t be disappointed. Great article. We have been very fortunate to have visited Asturias. We stayed in Oviedo at an AC Hotel which was near the railway station. A little hard to find but very very comfortable. Had one of the best bathrooms ever. Loved Oviedo it’s a beautiful city and the ‘Fabada’ and ‘Cidre’ was amazing. Just wanted to say that I love the newsletter always packed with different ideas and information. Gerry : Thank you for drawing the attention to visit Asturias which I shall make a point to visit next time when in Spain. It was a pity that I was unaware of this picturesque area. From your explicit description and the photos it really sounds a must visit place some day. Sounds and looks lovely, it certainly is a destination worth considering for a future holiday. Thanks for showing it to us..
Well done, you’ve captured the magic of Asturias and the whole coast in your article. I have been visiting that region – Gijon in particular – since 1970 (I was married to a Asturian for a few years and got to know the region really well). It’s a region very dear to my heart as it’s not the Spain that most holidaymakers think of. It’s very green, as it rains a lot, and they play the bagpipes. I still cook Fabada and drink the cider when I can. It’s amazing how many Asturian bars there are now in other regions of Spain! The transport links have greatly improved during the last 40 years and the motorways provide a fast route these days, whereas years ago the only way to get there was via a ferry to Bilbao, or Santander, and a long long drive along the main road which had many bends! In recent years I’ve used the Easyjet route from Stansted, or from Bristol (where I live) via Madrid. There is a very good coach link from the airport to Aviles, Oviedo and Gijon. I didn’t know about the ferry service via France though. Other food delights include some lovely seafood such as spider crabs, percebes (very expensive) and sea urchins, plus many more. I cannot recommend it enough for those who want to see something different and as the shipyards and coal mines are gradually declining they are welcoming tourists with open arms. Your love of the region shines through. I’m looking forward to our next visit already. My son-in-law’s abuelos are from a grouping of houses about 7 kilometres above Cudillero. My daughter who grew up in the Madrid area with us had the privilege of introducing her husband to his “raices.” We were able to join them for a wonderful stay right in Cudillero at a lovely hostal overlooking the harbor. I can’t remember the name, just the beautiful gray stone facade. The cafes in the plaza just adjacent to the boat ramp in the harbor were a delight! Being a US police officer, he was able to exchange department patches with the local police in the center of town. A visit to the lighthouse and the local cemetery looking for family was a great hike and adventure. Would go back in a heartbeat! Went to Gijon 2 years ago and stayed in the parador there.Had booked one night as we were touring the area but had such a wonderful room,and fab food in the restaurant, we splashed out on a second night.Lovely beach in Gijon and Llanes.Also lively bars and excellent shopping.We enjoyed visiting Valladolid,(flew in and out of there) a laid back small city ,friendly people and plenty of small bars with tapas. 3 years ago went to Galicia and realized just what the real Spain was like.Santiago a must,we also enjoyed Vigo, a port city,busy when the cruise ships are in. Looking forward to our next trip this May,but going to the area south of Madrid.Would appreciate any tips on that area. The thought of places like the Costa Del Sol do not interest me.Hey Ho we cant all like the same things! Some good suggestions there Marilyn … Thanks a lot. Hi Lynne,many thanks for your suggestion with our Spanish trip this year.We do like a beach as well as cities,but not too crowded! Went to Seville 7 yrs ago,loved it,time for another visit I think. I enjoy the newsletter ,and all the ideas that follow.The Spanish people are undoubtedly helpful and proud of their regions,so I know to expect a warm welcome, despite my basic language skills !!! Great article as usual….filled with helpful ideas and wonderful descriptions of the area, espcially some of the small towns you mentioned.. A place to put on one’s must see list….. Since I saw the movie Begin the beguine I fell in love with Gijon and the countryside.I think in my next trip to Spain I’llgo.Last year I was in Pais Vasco and loved it. Thank you for your articles. Guillermo. Hi Gerry, During my travels around Spain I have visited this area many times en-route to either Bilbao or Santander for ferries. I particularly like The Picos, Cangas de Onís, Covadonga I find this area the most relaxing end to a road trip. I have viewed your site for a long time now but never posted. Thanks for an excellent site, please continue. Ian. Thanks Ian … much appreciated. Enjoyed the article very much, not an area I knew very much about but will be making plans to visit as soon as possible. Great article Gerry. A couple of years ago we towed our caravan to that part of Spain … San Sebastion, Santandar, Gijon and also visited Bilbao. We had a wonderfull time with great weather. We love all your articles about Spain. Regards – Charlie. another very informative article again, thanks a lot Gerry. great article,really looks and sounds a great place to visit. which we will be doing later this year. A couple of years ago my wife and I spent three weeks in Spain and Portugal. We enjoyed the many wonders of the area, where I truly lived up to my Portugese nickname, ” Com tu beb tu”. We visited her cousin in Llanes and had a wonderful time and met another friend of my wife who took us to Gijon, where we had wonderful Bonita tuna. Do you have any recipes for Bonita tuna. Absorbing article. We were in Spain last year (from Australia) and did San Sebastian, Madrid, Toledo, Sevilla, Granada, and Barcelona. Have to come back now and see the northern coast. We also have fond memories of Vigo many years ago when we were working on cruise ships. Keep up the great articles! A really informative article, and once we’re settled in Extremadura it will definately be somewhere to visit for long weekends. I’ve seen Asturias on a cookery programme, the fish restaurants look like places to visit. Hi Gerry, I visited Asturias about 5 years ago with my husband. We stayed in Llanes a very beautiful part of the country. Also went on a visit Picos de Europa fantastic! we watched the vultures overhead and were impressed by the whole area and how green it is. Your article, as always, captures the feel of this beautiful part of Spain. This was the first time we had sampled Fabada, I now make it as a very welcome winter warmer, it is yummy. We are going to visit the area in April, I will let you know how we got on. Have a great time Neil … will look forward to your feedback. Some stunning views you make getting there sound very easy . May visit in the future . I have a brother who lives in spain . Thank you for the tip, well worth considering. Sounds like you had a wonderful time over in Spain. Thanks for sharing. My wife and I were in Portugal and northern Spain in ’06 during the World Cup, It was insane but fun! Always ask for the ‘aceitunas’, olives in the restaurants. They are usually stuffed with a fish, cod, sardines, or garlic. We have had the ‘Fabada’ and it was a meal in itself. My wife has a cousin that lives in Llanes and one night I heard bagpipes in the distant. The music wafting through the air was from somebody from the Basque region. As we left her cousin’s house, I said “Now I know what paradise looks like”. It is one of Spain’s best kept secrets. From Burgos then Leon, I drove through Oviedo onto Santander last September. Does that qualify as part of Asturias? Anyway, the trip was amazing, the scenery the dark rolling clouds and then the torrential rain that didn’t last too long and then cleared up nicely, right when we were rolling on the winding roads to the mountain’s top. Hi Sorin – Burgos and Leon are Castilla y Leon, Santander is Cantabria. You certainly drove through Asturias.